I know some of your children are learning Japanese or have an interest in Japanese culture. I found a great website I want to tell you about. And I found it (almost) in my own backyard! 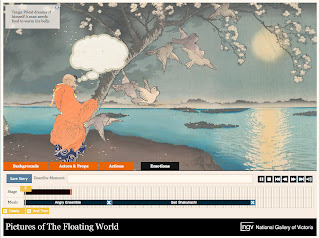 At the National Gallery of Victoria website, there is an interactive feature that encourages kids to create stories using some beautiful Japanese art. 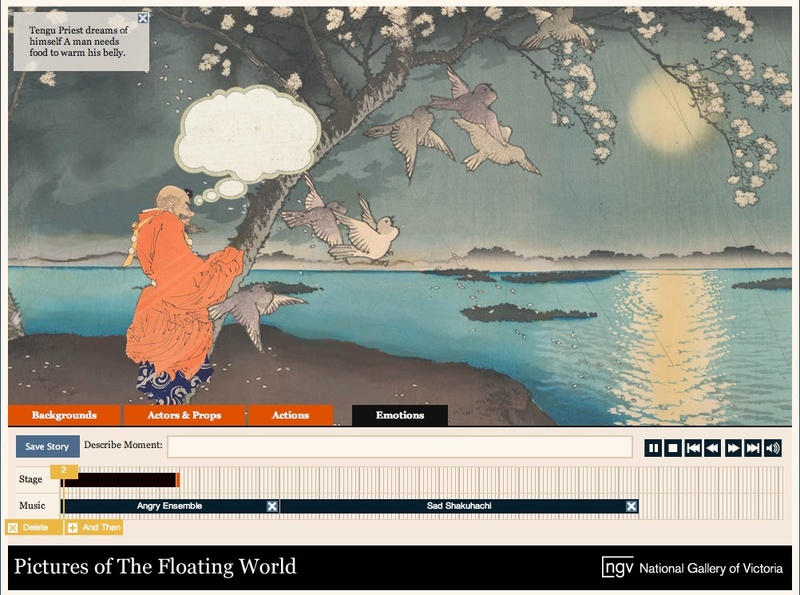 Stories From Old Japan is a simple animation system that allows students to create stories using the characters and backgrounds of the Pictures of the Floating World. It works particularly well as a small group exercise on an electronic whiteboard. On the Create Your Story page, you'll find a video that explains how to use the application, ideas on incorporating it into teaching and learning, and examples created by kids. There's also a pdf available of cards students can use to help them map out ideas before creating a story. The pdf is slow to download but is packed with that same lovely art. Oh, Book Chook, you are so good to me!! Ha! I knew you would love it Jeanne! Happy creating! Hi. I've always loved creating pieces of writing from observing art, but this takes it to a new level! Thanks for all the creativity in your blogs. It IS beautiful, isn't it? Thanks for the great feedback, Janeen! What stunning artwork. Doing stories with artwork is a great idea. I agree Kelly. Lots of us are visual people, and involving art work somehow sets our stories free. I agree - I love those muted colours! Thanks for the lovely review, Susan. We also run a small Ning to support teachers and others using Stories of Old Japan. The most useful content is the case studies of teachers using Stories of Old Japan in their classes. There are two there at the moment: a year 5 primary school teacher and a year 9 Japanese teacher. I'll be adding more as I get a chance. Thanks for the extra information, Jonathan. And congratulations on designing such a lovely story creator!